GPS or global positioning system devices are well known for their efficient tracking capabilities. However, very few businesses know that an effective tracking app is a necessity to extract the right information. Have control over your vehicles form anywhere with just one mobile app. Under how fuel consumption can be minimized by tracking the vehicle’s idling time period. Track when your drivers report, where they stop how they resume. Prevents the wear and tear of the vehicle by keeping a track of your vehicles’s driving speed.This also contributes to the fuel efficiency and driver’s safety. Prevent fuel theft and false reports by tracking how much distance your vehicle’s have covered. with live google map support. The app is flexible and serves both android and iOS platform.it can be customized for your current tracking device such as Garmin. Once you are ready to go ahead. We would scope your entire requirement with your business logic. We would work out the technology and effort estimate required for development for your project. Your company can buy tracking devices from us or buy them themselves for your vehicles. IT Chimes would then work on all the technology required to make this GPS tracking device data be available to you. Then all you have to do is add your drivers and vehicles and start tracking data. The features that you generally get in the default GPS application usually does not comply with your requirements. Many times, you even wish to customize it for your business. We build GPS device tracking mobile applications so that you can locate your vehicle, your fleet systems, an individual, pets and any moving entity in real time. Let’s discuss few features that we can add to your custom GPS tracking mobile application. Avoid those delayed information and track your vehicle’s position in real time. This would help you in guiding your fleet drivers about the route. Also, it lets you know whether your fleet or vehicles are moving consistently or not. Fuel theft is a common issue among fleet business. Vehicle idling is another issue that consumes a lot of fuel. Even when you just wish to keep the track of total distance that is covered during the day, you can automatically get the expected fuel efficiency figures using this app. Driving a vehicle comes with the set of responsibilities. The app can track how consistent your drivers are during the route and lets you instruct them accordingly. It also lets you know when and how your drivers are putting the vehicle on idle and when they resume. Speeds can be tracked using the app. The app would notify you if the speed limits that were instructed to the drivers are crossed. This contributes to fuel efficiency, prevents wear and tear of the vehicle and let your vehicles comply with the legal road regulations. Learn how much distance is covered and which routes were taken by the drivers. Tracking app lets you suggest or guide them through notifications and messaging feature. The app is compatible with both the android and iOS platform and can be tailored for your requirements during the development process. All you need to do is to specify your preferences and that is all. You can check out the reports regarding each and every vehicle activity during the day, review the daily summary and specific location based activities too. Also, you can check the inbuilt analytics tools to conclude further improvements in your fleet management strategy. 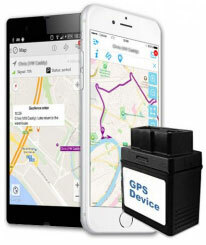 While we do not restrict our GPS App development to just vehicles, we do customize it for every GPS tracking requirements within the boundaries that complies with legal regulations. Contact us to get the quote or more information about the product.